Password Protected Web Interface to update your store with new categories & products; change prices, names & descriptions. User friendly, easy to learn. Customizable Store Front content allows you to feature special items with links to product pages, or discuss promotional features or events. Data Harvested from customers may be easily downloaded to your desktop in a text file to integrate with your local database. Category List can be displayed on every page of your web site, giving visitors instant access to shopping – even from your general information pages. Easily set up cross-linking between general info pages and your store pages. Shipping Options based on your needs. Can include automatically integrated shipping charges with UPS, USPS, Fedex. Product Attributes such as size, or color. Specialized product customization can be built into your site in all sorts of convenient ways. 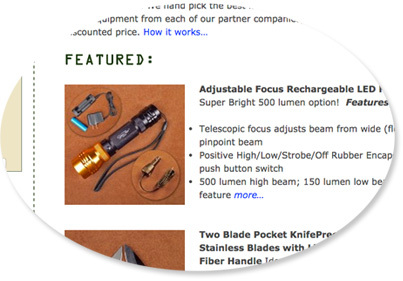 Featured Item places an item selected by you into a particular location on your site, such as your site header, for prominence. Multiple product images and enlargements. Zoom in, zoom out. Zoom zoom zoom. Product Pages include text about product, picture, price and “buy” link. Also may include a heading image displaying available attributes. Link to popup image. Credit Card Payments processed online automatically through third party CC gateway, by Paypal, or by you in your office. Database-Driven Store allows customers to search by product name, description, category, or price range. Automated Thank You/order confirmation emails, and merchant notification. Gift Registry allows customers to set up a wish list, or buy for a friend’s wish list. When you sell online, it's important to make the customers' experience easy and safe. To that end, the automated shopping cart format is the best way to go, and has become a web standard. When a user selects an item to buy, she is shown the items in her cart, and a subtotal of the cost. Once she decides to check out, she enters her name, address, and phone number; selects a shipping method, and enters her credit card information. 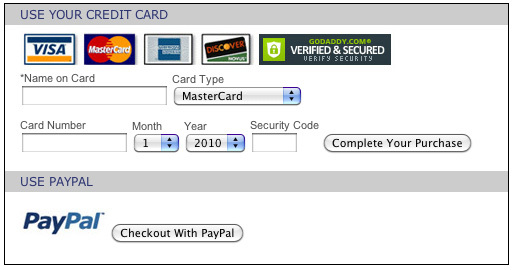 Credit card information is entered on a secure server -- a special web hosting computer where data is encrypted, to prevent anyone from stealing the information. When the customer checks out, their order is emailed for processing (except for the credit card info, which should remain on the secure server untill it is collected by authorized personnel.) The emailed order could either be sent to the merchant’s office, or to a third party fulfillment and shipping operation. The secure credit card information is processed either by the merchant's office, or by a credit card service which verifies and processes the information automatically. It's your decision as to what level of the ordering process is handled by your office, and what is handled outside. If you are starting a new business, you may want to process your orders and your credit card data in-house, until you determine the volume of business you will be doing. You may also want to give customers the option of ordering in different ways. Some of your customers may prefer to order via a toll-free number, after using the shopping cart to look at items and check prices. You might also provide customers the option to print out an order form and fax it in, or mail it with a check. Providing as few barriers to ordering as possible, and making the process easy, will help your sales. Letting customers know that their credit card orders are secure is important. It is also now mandatory that you display your company's policy about passing on a customer's name, address, and buying habits information to other businesses. We build online stores for our clients, and customize them to their needs. We make big big big ones, and we make little tiny ones. If you need an store in Santa Fe or anywhere in the US, contact us.